James Allen is one of the most popular online diamond retailers, and rightly so. Established back in 1998, the company has earned a reputation for offering high-quality jewelry at competitive prices, as well as great customer service. Below we have reviewed James Allen and the quality of its service, emphasizing the features that we think are important when evaluating an online jeweler. How well can the customer see and examine in detail the product before purchase? 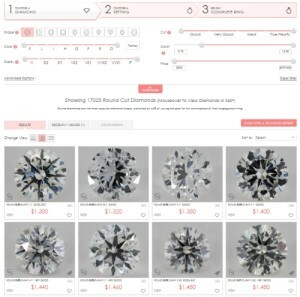 Can the customer buy loose diamonds and not only pre-set diamond jewelry? 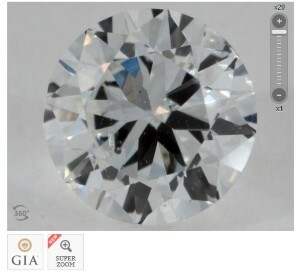 Is there third-party certification of the quality of the diamonds sold? How reachable and responsive is the Customer Service department? What are the retail policies of the company (return policy, shipping costs, upgrade & buyback policies, and warranties)? If you go to James Allen’s website, you will see that it has a critical feature that few online vendors offer – you can view each loose diamond offered there from a 360-degree perspective. You can rotate the stone and see it from all sides, just as you would if you were looking at it through a real jeweler’s loupe. James Allen’s 360-degree diamond display technology allows you to look at a diamond from all sides. The reason it is crucial to be able to see a diamond before you buy it is that stones can vary dramatically in terms of appearance, even when it comes to diamonds of the same color, clarity, and cut. For example, one SI1-clarity diamond might look clean to the naked eye, while another SI1 diamond might have an inclusion that is more easily noticeable due to its more prominent location or the way it reflects light. 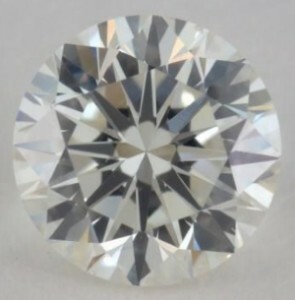 An SI1-clarity diamond with a visible inclusion located centrally. An SI1 diamond without visible flaws in the center. To illustrate this point, we have included two pictures of SI1 diamonds above — the top one shows a diamond with a visible inclusion in the center, while the bottom picture shows a stone that is clean of such flaws. Although both diamonds are classified in the same clarity grade, they look different with respect to the visibility of their inclusions. Keep in mind that diamond clarity and color grades should be actually thought of as grading ranges, in which stones can vary in terms of how colorless and clean they look. So, as you can see, going solely by the letter grades that describe a diamond in its certificate may not be enough to determine how it actually looks. This is especially true for stones of lower clarity and color grades. For all the reasons mentioned above, our advice is to shop at places where you can actually see with your own eyes what diamond you are buying. 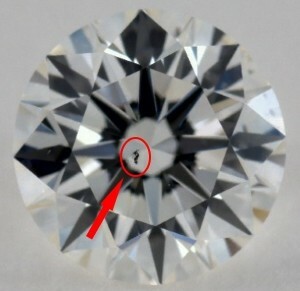 And this is also why we recommend James Allen, as the viewing technology it employs is unique in allowing you to see every single diamond in the inventory and inspect how clean and colorless it looks by rotating it at 360 degrees. Many jewelers offer pre-set diamond rings and other jewelry. While this option is fast and convenient when buying cheaper pieces, for more expensive diamond jewelry, our advice is to select a good loose diamond first and then have it mounted in a setting of your choice. James Allen allows you to do exactly that – you can browse their inventory of diamonds until you find a stone that looks good to you and fits your budget, and then choose a setting in which the diamond should be set. James Allen allows you to do choose a loose diamond first and then select a setting in which the diamond to be set. Why is it better to buy diamonds loose? An important advantage to buying a loose diamond is that you can see it from all sides and inspect it for visible flaws. Unlike a loose diamond, a stone that is mounted in a setting cannot be examined as easily because the setting hides some parts of the diamond. This is why we recommend that you first take your time to pick a loose diamond that looks clean and reasonably colorless, and then select a setting for it. Of course, there are times when pre-set jewelry is a perfectly fine choice. But if you are looking to buy a pricey piece of jewelry, such as an engagement ring, it’s better to select your center diamond loose and make sure that it is exactly the quality that you want, at a price that you can afford. This is especially important if your budget allows you to buy only a diamond of clarity lower than VS1-VS2. For such stones, it is recommended that you browse through the available inventory so that you can select a diamond that really looks clean to the naked eye, as some diamonds in these clarity ranges have flaws that are more visible. 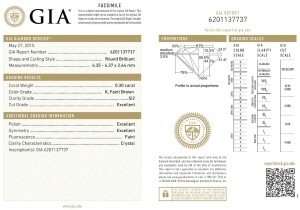 Loose diamonds sold by James Allen come with certificates that serve as proof of their quality characteristics. These documents, also called diamond reports, contain information about the diamond’s color, clarity, cut, and carat weight, as well as its symmetry, polish, and other features. It is important that any loose diamond you buy is accompanied by a certificate issued by a reputable third-party grading lab because this is one of the best ways to get an unbiased evaluation of the diamond’s quality. James Allen sells loose diamonds graded by the AGS (American Gem Society) and GIA (Gemological Institute of America) – two of the most trusted diamond grading organizations in the world. Unlike places that are unavailable outside of regular business hours, James Allen offers 24/7 support by chat, email, or phone. What we like most about James Allen, though, is its dedication to ensuring that customers are satisfied. For example, the company president, Mr. James Allen Schultz, makes himself available to customers if they request to speak with him in order to resolve any issues they might have. Not all retailers are as responsive and willing to go out of their way to address customers’ concerns. James Allen definitely stands out in this respect among established online jewelry vendors. If for some reason you are not satisfied with the jewelry you bought, James Allen will refund 100% of the price you paid provided that you return the product within 30 days of the date it was shipped. You won’t be charged any fees for the return. What’s more, the company will pay the return shipping costs if you are located in the U.S.
Diamond jewelry is expensive, and being able to get a full refund greatly reduces the risk of paying a lot of money for a piece you might not like, especially when it comes to online purchases. What does this mean in practice? For example, if you’ve bought a diamond for $2,000, you can exchange it for another that is worth at least $4,000. The value of your old stone, $2,000, will be credited towards the purchase price of the new stone, and you will need to pay the rest in cash. So, if the new diamond costs $5,000, you will need to only pay $3,000 in cash when you return your old stone. If you want to sell your loose diamond within two years of the date you purchased it, James Allen will buy it at 70% of the original price. This is a pretty good deal when you consider the fact that most diamond dealers pay less than 50% of the retail price, and many offer as low as 20%-30%. If there is a problem with the jewelry you bought, you can send it back to James Allen to be inspected and repaired. James Allen’s lifetime warranty covers re-polishing of rhodium plating, replacement of lost side stones due to broken jewelry parts, and prong tightening. You can have your jewelry re-polished, re-plated with rhodium, cleaned, and you can have its prongs tightened during the life of the jewelry – all this free of charge. Wherever you are located, you won’t need to pay any shipping fees if you order from James Allen. Even if you reside outside the U.S., shipping to any country in the world is free.